Since inception, more than 21,000 journalists have been trained at more than 550 locations across the United States and Canada on the use of the continually evolving suite of Google tools. Read more about the SPJ Training Program and the Google News Initiative here. In 2019, the program focuses on conferences, conventions, regional events and other places where a maximum number of journalists can be reached with this valuable  and, to host organizations, free  program. Downloadable teaching tools are also available through SPJ and the Google News Initiative to educators and students. – What does the training include? – Why is Google News Initiative providing this training to journalists? – What does the host organization need to provide? – What are the Google tools that can be taught to us? Since 2016, SPJ has worked alongside the Google News Initiative to offer in-person Google tools training in newsrooms and classrooms around the country. That effort has expanded to provide educators instructional materials, based on those tools, that they can download and incorporate immediately into their classrooms. The training includes a workshop lasting from one to three hours providing an overview of the Google tools or providing in-depth training on one Google tool. Longer trainings can be discussed. A trainer is provided at no cost to your organization. Thanks to a grant from the Google News Initiative, SPJ pays the trainers fee as well as travel expenses. Why is Google News Initiative providing this training to journalists? Access to information is more important than ever. And Google tools provide valuable, inventive and often unexpected ways for journalists to access and process information for the betterment of their stories and the benefit of their readers. 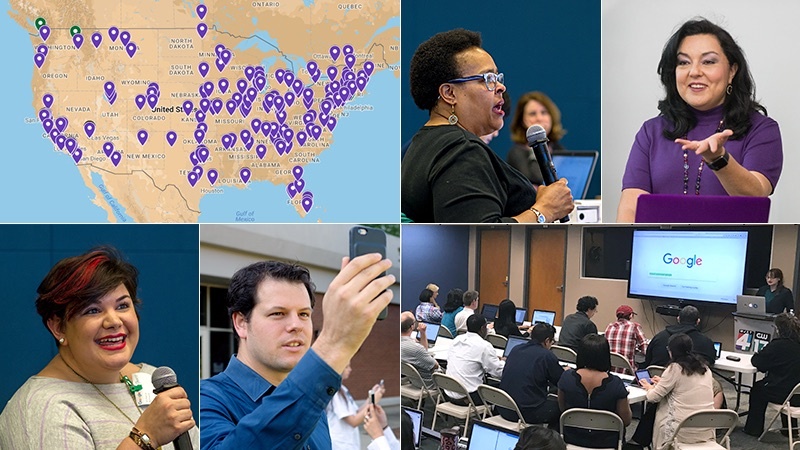 SPJ and the Google News Initiative teamed up in 2015 to provide free training to journalists around the U.S. looking to apply these tools in their news gathering, reporting and storytelling. The programs are provided by talented, personable, knowledgeable SPJ members who have been trained by the Google News Initiative. Amara Aguilar (@amara_media) is a digital journalism professor at USC Annenberg School for Communication and Journalism. She teaches journalism for mobile/emerging platforms, social media, and interactive design, among other courses. Amara has written for the LA Times, CNN and other outlets. She has worked as a designer, reporter, social media engagement producer and consultant. Andy Boyle (@andymboyle) is a writer, web developer and comedian. Before becoming the Director of Platform Architecture at Axios, Andy worked at Breaking News, the Chicago Tribune, the Boston Globe, the St. Petersburg Times, and The New York Times Regional Media Group, where his work was cited in the 2012 Pulitzer Prize for Breaking News. Sandra Gonzalez (@SandraGonzalez2) is a veteran multimedia journalist based in Houston. Gonzalez has been reporting news for more than 20 years in both TV and radio, many of those years in Dallas/Fort Worth, and New Orleans. She interviewed civil rights activist Cesar Chavez early in her career; later covered the tragic kidnapping and murder of the child Amber Hagerman whose name is now known around the world through the Amber alert. In New Orleans, Sandra also reported on the recovery efforts following Hurricane Katrina and the environmental disaster of the BP oil spill. Sandra is an active member of both SPJ and the National Association of Hispanic Journalists. Michelle Johnson (@mijohn) is an associate professor of the practice, multimedia journalism, at Boston University. Johnson is a former editor for the Boston Globe and boston.com. She was part of the team that launched boston.com in 1995. At the Globe, she started as a copy editor on the night desk and was eventually promoted to a variety of editing positions including senior assistant night editor, assistant political editor and senior assistant business editor before helping to launch boston.com. After leaving boston.com, Johnson freelanced the paper's Personal Tech column for six years and worked as a web consultant. Prior to joining the faculty at Boston University, she taught for two years at Emerson College. Johnson has volunteered for many years as a professional mentor on student projects for NABJ, NAHJ, AAJA, NLGJA and UNITY. Scott Leadingham (@scottleadingham) oversees news on all platforms of Northwest Public Broadcasting, an NPR and PBS member station. He was previously director of education for SPJ. In his spare time you can find him reporting and writing for various outlets, particularly with a focus on the Northwest. Or, really, doing something  anything  outdoors. Victoria "Vix" Reitano (@vixinthecity) is a Social Media Strategist, Editorial Marketing Expert, and a Content Strategist and Creator. She appears on-air to share the ins and outs of social media for brands, individuals and job seekers. She has managed digital media brands at ABC's LIVE with Kelly and Michael (where she produced their first Google+ Hangout after growing the audience by 600K+ in 9 months), Telepictures' "bethenny" and at NBC, where she launched the digital presence for The Meredith Vieira Show. She is the Founder and CEO of CreatiVix Media, a boutique digital agency based in Manhattan. CreatiVix Media is a digital agency created to disrupt the agency model. The team can edit content, manage social media strategy and create video Web series for brands, journalists, authors, celebrities, CEOs and entrepreneurs. As an expert, she regularly contributes to blogs, online publications and more about the fundamentals of digital marketing, how to properly brand yourself and ways to advance your career on a digital job track. She is currently a regular contributor to The Huffington Post, Elite Daily and Levo League. Lara Salahi (@BostonLara) is an assistant professor of Broadcast and Digital Journalism at Endicott College in Massachusetts. She is also a New England regional field producer for ABC News. Jorge Luis Sierra (@latinointx) focuses on the intersection of digital technology, investigative journalism and cybersecurity. Sierra develops risk assessment tools and crowd-sourced maps to track crime, corruption and attacks on journalists. An award-winning Mexican investigative reporter and editor, he has covered a range of conflict-related topics such as drug trafficking, organized crime, counterinsurgency and gangs. Samaruddin (Sam) Stewart (@samsends) is a journalist and media technologist based in the San Francisco Bay Area and is the co-founder and project lead for the grant-funded Verified Pixel Project. Sam is currently the US Department of State's 189th Franklin Fellow, serving as a media expert providing strategic advising on media outreach and audience engagement. Previously, he was selected by Stanford University as a John S. Knight Journalism Fellow where he researched the application of technical verification on user-generated digital images. He frequently trains, speaks, and researches how technology can assist storytelling; including how best to harness and verify user-generated content and utilize aerial drones for newsgathering. His prior work includes managing and editing roles at AOL, Agence France-Presse, and The Arizona Republic. He holds an MBA from Central European University and both a master's and bachelors degree from Arizona State University. He was selected by the Fulbright Program in 2014 into the Specialist Grant roster and also serves as a board of supervisors appointed arts commissioner for San Mateo County, CA (pop. 750,000). Samantha Sunne (@samanthasunne) is a freelance reporter based in New Orleans, where she runs a journalism/tech group called Hacks/Hackers. She also teaches journalists to utilize data and technology, and publishes a weekly newsletter called Tools for Reporters. Deb Halpern Wenger (@dhwenger), a 17-year broadcast news veteran, is associate professor of journalism and head of the journalism department at the University of Mississippi. Prior to her academic appointments, Deb was assistant news director at WFLA-TV in Tampa, Fla. Wenger conducts multimedia training in newsrooms around the country and is co-author of the broadcast, online and multimedia journalism curricula for the SPJs Newsroom Training Program. Wenger is co-author of a journalism textbook, Advancing the Story: Broadcast Journalism in a Multimedia World and produces a multimedia blog: advancingthestory.com. Benét Wilson (@benetwilson) is a veteran freelance aviation journalist based in Baltimore, where she writes for trade and consumer publications. She serves on the boards of the Online News Association, the National Association of Black Journalists and Mercer University's Center for Collaborative Journalism. Jordan Wirfs-Brock (@jordanwb) is pursuing a PhD in Information Science at the University of Colorado. Previously, she was a data journalist with Inside Energy, a public media collaboration, where she demystified energy topics. She loves using animation, visualization, podcasting and other creative ways to tell complex stories in approachable ways. Though SPJ currently is not looking to add new trainers to the program, please email Lou Harry if you are interested in being considered to serve as a trainer in the future. She can notify you if SPJ begins a search for new trainers. The trainers are SPJ members who have received training from the Google News Initiative staff. What does the host organization need to provide?  Marketing of the training program to reach a maximum number of event attendees. Prime positioning in your program, with minimal concurrent programming, is encouraged.  A location for the program that will hold all the participants with, if possible, table space for personal laptops.  An LCD projector/screen, laptop audio, Wi-Fi, and power.  Encouragement of audience to complete a brief post-training online survey.  Prompt communication should there be any change in schedule. What are the Google tools that can be taught to us? Stay in the know on breaking stories that are important to journalists. Gather data from real people by creating your web surveys. Tell stories with satellite imagery, maps, terrain, 3D building and more. Show where stories happen by building interactive maps. Learn proper usage and citations for Google products. Access a world of data and create high-quality visuals. Bolster stories with academic papers, opinions, and citations. Research with precision. Simple tools and tips to help you get better results, faster. On assignment across the world, or in an diaspora community across town, you may find yourself in a situation where you need help bridging a language gap. Use real-time search data to bring people the stories theyre looking for. Cultivate and keep a YouTube audience. It's easy! Just fill out this form. Please note: This training is available only for organizations based in North America. About the Google News Initiative: The Google News Initiative is Google's unified effort to help journalism thrive in the digital age. It's focused on three key objectives: elevating quality information, evolving business models to support quality journalism, and empowering news organizations to use new technology to meet their needs. About Society of Professional Journalists: The Society of Professional Journalists is the nations most broad-based journalism organization, dedicated to encouraging the free practice of journalism and stimulating high standards of ethical behavior. The organization promotes the free flow of information vital to informing citizens; works to inspire and educate the next generation of journalists; and fights to protect First Amendment guarantees of freedom of speech and press. Support excellent journalism and fight for your right to know. About the Google News Initiative: Google's mission is to organize the world's information and make it universally accessible and useful. The News Lab was created to support the distribution and creation of the information that keeps us all informed about what's happening in our world todayquality journalism. Today's news organizations and media entrepreneurs are inventing new ways to discover, create and distribute news contentand we're here to provide tools, data, and programs designed to help. For more information, visit g.co/newslab.